The culture of comics fandom has shifted so much over the last twenty years that it’s almost unrecognisable. It’s become this symbiotic thing that lives and breathes as part of pop culture, television, and film. The juxtaposition between the world after the Marvel Cinematic Universe and The Walking Dead — t-shirts on every second person on the high street, Funkos everywhere, HerUniverse, etc — and my childhood, growing up a poor, little nerd in East London, buying second hand comics from car boot sales and Spitalfields market after early Saturday morning cartoon marathons. Being told that your interests are constantly strange, niche and not worth your time, love or effort. Even in the days of McFarlane, Liefeld and Jim Lee at Marvel, when comics were selling millions every week, there were few outside of the comic book world who understood the impact these books could have on you or cared about the stories being told. 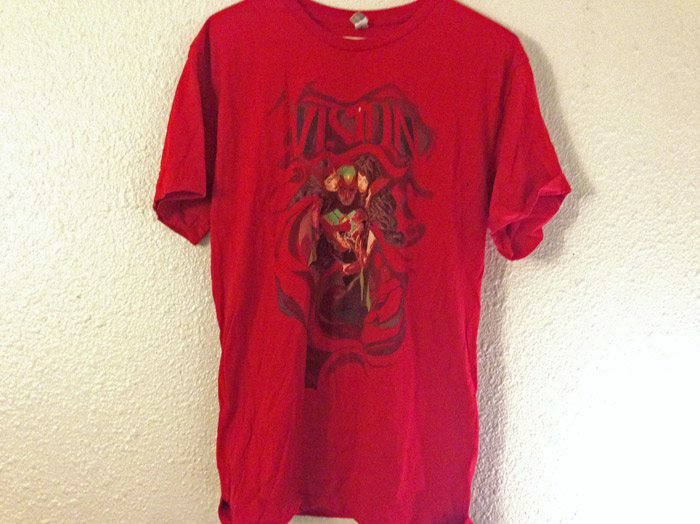 I can remember the first time I found a comic book t-shirt that was brand new and for under ten pounds. It was a complete and utter revelation. Primark had been a staple in East London for years, a budget clothes chain which was synonymous with getting picked on in school and never quite finding what you wanted. Yet sometime in the mid 00s, they began to stock a few pieces of licenced clothing. It’s no coincidence that this came so soon after the release of Christopher Nolan’s acclaimed Batman Begins in 2005. That film had the cinematic impact of Alan Moore’s Watchmen in making comics palatable to the mainstream, creating an intellectual, seemingly complex and adult rendering of the once completely wacky world of Batman. Though it wasn’t until the culture shock of Iron Man and the MCU in 2008 that high street shops truly became one with comic book merchandise. Now you could pick up an Avengers printed dress as easily as a pair of plain black gloves. These things that had seemed so out of reach and hard to get hold of were suddenly completely available, affordable, and shockingly marketed at women. You could walk into pretty much any chain in London and buy Wonder Woman underwear, an Incredible Hulk sweatshirt or Batman tracksuit pants. Comic book clothing had truly arrived. Last year I moved to America and quickly discovered that the licensed merch boom had been transatlantic. Every supermarket, chain store and super store was stacked to the rafters with awesome, odd and obscure comic book clothing. Not only t-shirts but now you can buy a Deadpool onesie, a Black Widow nightgown or how about a Venom underwear set? Here the popularity of comics is so huge that characters that most people probably wouldn’t have recognised two or three years ago have entire ranges of products. As a new resident I couldn’t have been happier; gone were the days of having to search high and low for anything that represented the thing that I loved so much. I adore this democratisation of comic book fandom. It is one of the loveliest things about the huge contemporary popularity of comic books. Where once comics were a niche, elite thing that you could only share your love for through over priced t-shirts and answering a thousand questions on Batman’s shoe size from men frothing at the mouth with frustration that other people dare read “their comics”, now anyone can find a shirt and represent, (literally) own the things that they love by wearing them on their chest. To celebrate this wonderful, surreal moment in comic book history I’ve written about ten of my favourite shirts from my twenty eight years of life, and am going to share them with you, right here. When I was a kid I was obsessed with Teenage Mutant “HERO” Turtles (as they were called in the UK where I grew up). Everything about them was cool. From the dark and scratchy black and white original comic books they inhabited, to the bright and brilliant cartoon that I knew off by heart. I fell in love with Raphael and Casey Jones, foretelling years in terrible choices in men; I wanted to be April O’Neil, a badass reporter who helped the turtles as much as they helped her. My best friend Alex has always had the coolest shirts. When we met in our early teens we’d bonded over our love of emo music and our mutual crushes on the best at what he does — Wolverine. The short and stout Canadian had for some reason been an important part of both of our burgeoning sexuality and whether in the pages of Claremont’s Uncanny X-Men or on our Saturday morning screens we couldn’t get enough of everyone’s favourite Alpha Flight member: Logan. Which was lucky, as he was everywhere. I’m pretty sure that when Marvel finally killed him off (last time, a year and a half and counting) it was after a realisation that old Adamantium Claws was in over 200 ongoing titles. 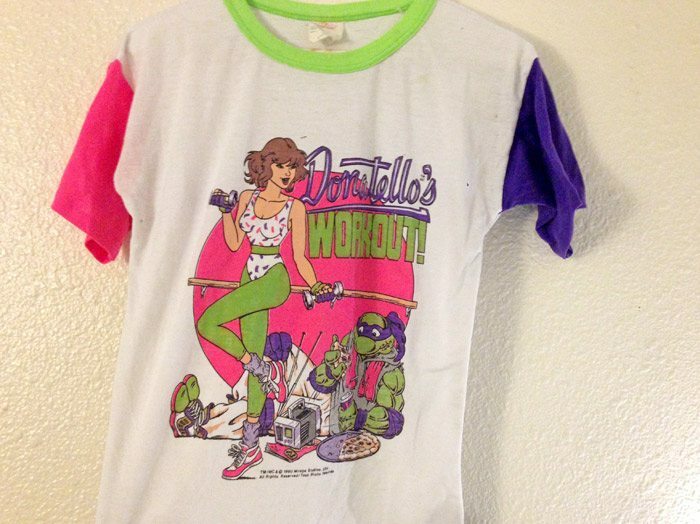 I clearly remember discovering this shirt and thinking it was the epitome of “Cool”. I’d been obsessed with the Scott Pilgrim books from Oni Press and had been wondering around my local comic shops one day to kill some time, saw Scott and Ramona kissing on a vivid blue background and knew I had to have it. This was likely in part to the fact that I was in a hugely toxic relationship with someone who thought “Manic Pixie Dream Girl” was a compliment, but hey– this is still a very cool shirt. Also an expensive shirt, one of the few “proper” comic tees that I’ve ever bought from an actual comic shop, as it was before the licensed merchandising boom of the late zeros. This was from a set of shirts released to celebrate the thirtieth anniversary of my fave comic of all time — Love and Rockets. This is such a wonderful shirt. 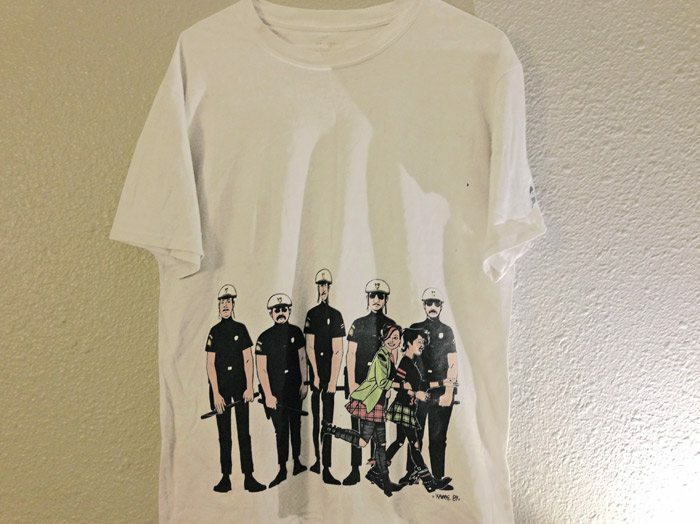 Having Maggie and Hopey running past the police is just such a subtle yet powerful image, and it sums up so much of what the book is about — growing up, love, rebellion, loss, racism, sexism, fun — it’s definitely my favourite out of the shirts that the Hernandez Bros created for this range. Such an iconic, simple and radical design. Just great. Batman is obviously a terrible fascist, whose books we all read and who is regularly celebrated despite almost a century of unforgivably awful behaviour. Yet thanks to Tim Burton’s 1989 Batman movie he also has one of the most badass logos of all time. 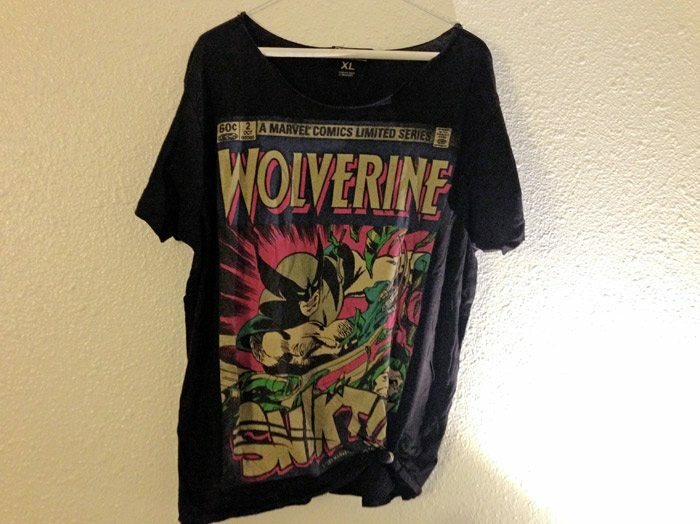 I adore the simplicity of this shirt, I bought it in around 2013 and comics shirts were so normal at this point that it only cost me around five or six pounds. There’s something about the iconography of this design that makes me feel like I’m casually cosplaying Batgirl every time that I wear it out and about. The best thing about Batman is arguably his rogues gallery or the Bat-family and it’s rag tag group of young, vulnerable yet incredibly tough members who regularly out do their very flawed patriarch. 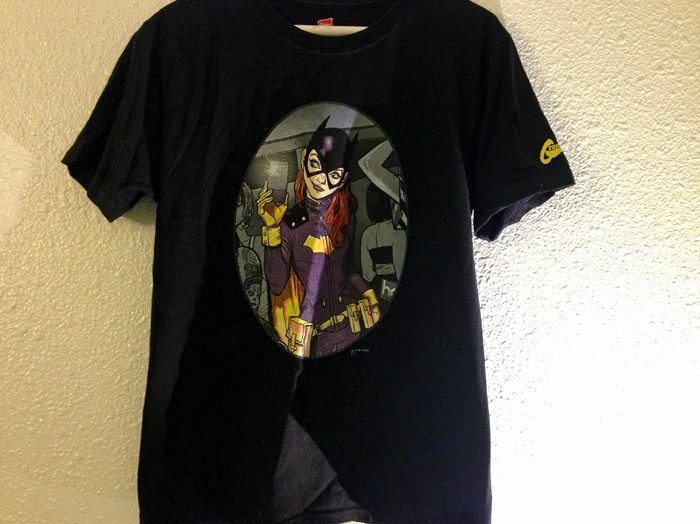 This shirt is amazing for many reasons the first being Babs Tarr’s incredible artwork from the cover of Batgirl #35. The imagery of Barbara taking a selfie as Batgirl in a dirty club mirror was instantly iconic. There’s a rebellion in showing a powerful young woman doing something that men hate so deeply — trust me men HATE women taking selfies — that is done in such a carefree and joyous way. 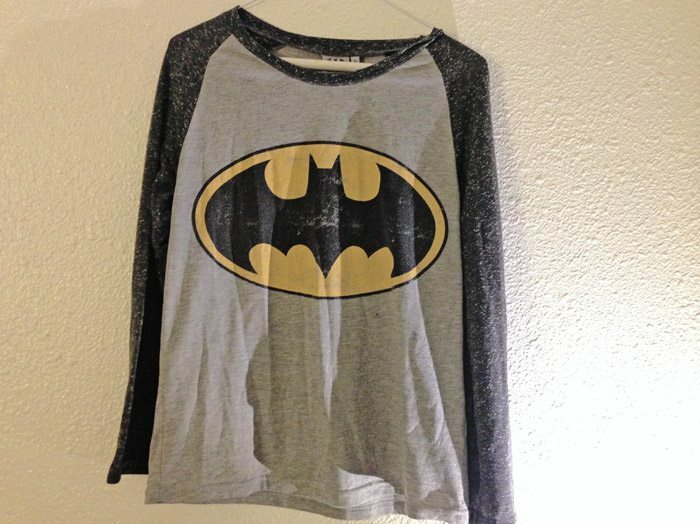 Plus men HATE this shirt, this is the shirt I’ve been harassed the most for wearing. So many incandescently angry men demanding that I explain why a superhero would be doing something stupid like taking selfies. It’s wonderful the power that this shirt has over terrible comics dudes. During my time at Orbital comics in London I met one of the most special and brilliant people in my life: Adam. When DC launched Frank Miller’s DK III we were both taken aback by the brilliant and revolutionary twist that the book ended with *spoiler alert* Carrie Kelley as Batman. Though this was quickly retconned in the third issue we were determined to champion the woman who we both knew should truly hold the mantle of Batman. So we got these shirts made– it was the first time I’d gotten a comic book fandom shirt professionally printed and not just made it myself, and this is without fail the shirt I get the most compliments and queries about. 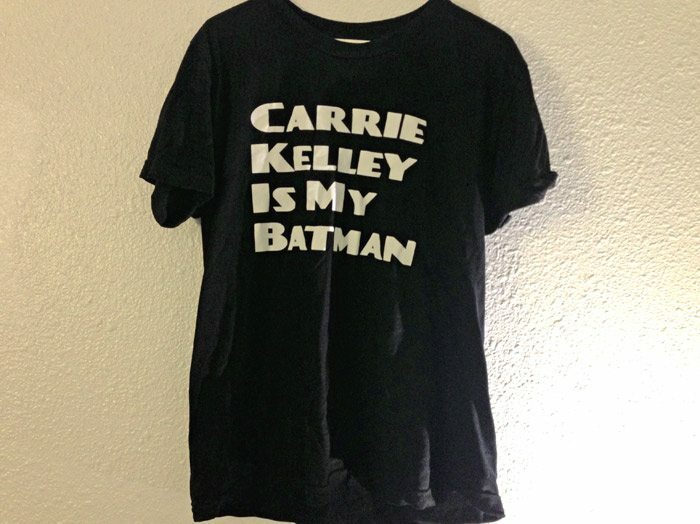 People are really here for Carrie as Batman. One of the strangest and most wonderful parts of the saturation of comic book culture and merchandising has been the proliferation of strange comics shirts ending up in odd stripmall outlet stores. 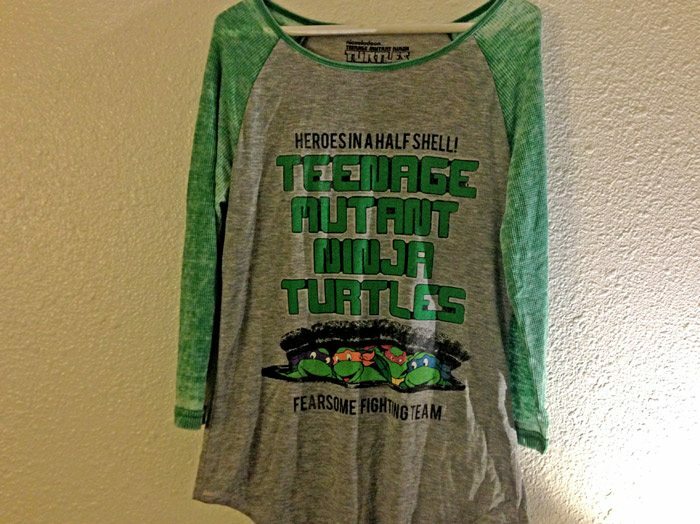 I moved to Long Beach in summer 2016, and have since found a treasure trove of weird and wonderful nerdy merchandise, none perhaps so wonderful as this long sleeve Ninja Turtles t-shirt, which is so well designed and brightly coloured that I fell in love with it almost as soon as I saw it. The most surreal thing about this shirt was that it only cost $2. There is definitely something larger to be said about the pop culture heavy bubble we have been living in, and the over creation of merchandise, which ends its life in these outlets and how that is surely a sign that the bubble may soon burst… but TWO DOLLAR TURTLE SHIRT!!! Tom King and Gabriel Hernandez Walta’s Vision book was one that found me right at the perfect moment to make me fall in love with it. There was something about the dark, melancholy sci-fi that created a small obsession in me that didn’t quit. Mike Del Mundo’s cover for Vision #7 made me cry the first time that I saw it, walking into work on a slightly hung over Wednesday morning. Depicting my favourite Marvel analogue Scarlet Witch engulfing her one time love the Vision, it broke my heart and filled it up all at the same time. When I saw that they had a shirt of it on We Love Fine I had to buy it, it was the first thing that I’d bought from this hub of fandom, a true bastion of everything that has changed about comics culture, and it’s still one of my favourites to this day. When I first moved to Long Beach one of my first stops was Universal Studios, because I’m a huge nerd and the idea of a Transformers ride alongside The Wizarding World Of Harry Potter was just too much for me. So we embarked on our adventure and it was amazing, but one of the unexpected highlights was the discovery of a tourist outlet store that had an incredible sale rail of very odd comic book shirts. Within this treasure trove of nerdery was one of my all time favourite comic book shirts. 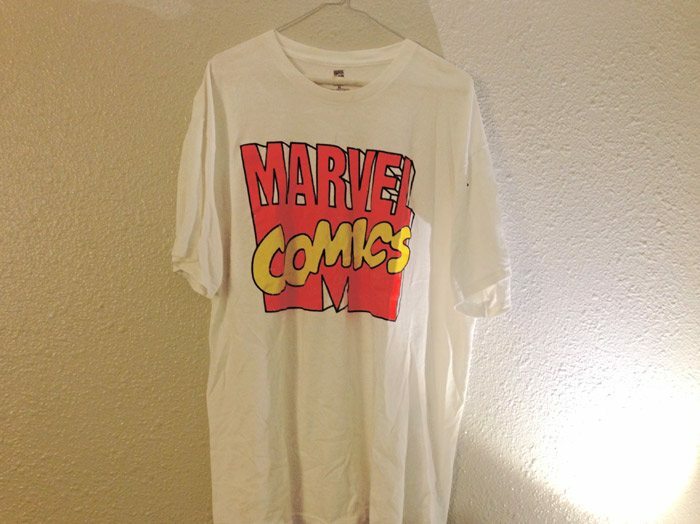 This classic Marvel shirt was a truly miraculous find, as it’s not a retro referential reprint of the iconic and now defunct logo, but an actual t-shirt from the blockbuster era of the company. Whenever I rock this shirt it makes me feel like a little kid opening Uncanny X-Men fresh off the newsagent shelves.